BRONINGTON was laid down on 30 May 1951 by Cook, Welton and Gemmel in Beverley, Yorkshire. She was launched 2 years later on the 19 March 1953 by Mrs W G John, wife of the Director, Naval Constructors. She was completed in June 1954 and named after a village near Wrexham. Built on the River Hull, a tributary of the River Humber, she was to remain in that area for four years. She entered service with the Royal Naval Volunteer Reserve’s Humber Division and was renamed HMS HUMBER, assigned for 4 years to 101st Minesweeping Squadron based in Hull. During this period she won the Thornycroft Trophy for minesweeping excellence, against competition from both regular and reserve units. Reverting to her original name in 1958, after the Humber Division was disbanded, HMS BRONINGTON rejoined the fleet and served in various squadrons before entering refit in 1963 to begin her conversion to a minehunter in Rosyth Dockyard. Alterations included the fitting of an enclosed bridge, a tripod mast and the latest sonar. 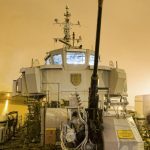 In February 1965, she recommissioned as part of the 5th Minesweeper Squadron, which was based at HMS VERNON in Portsmouth. 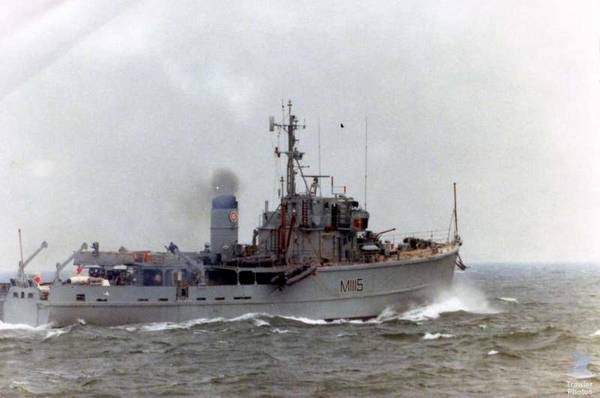 She returned to Port Edgar to Gibraltar Dockyard for a major refit, and then returned to the Forth in 1976 for further service in home waters for the 1st Mine Counter Measures Squadron. 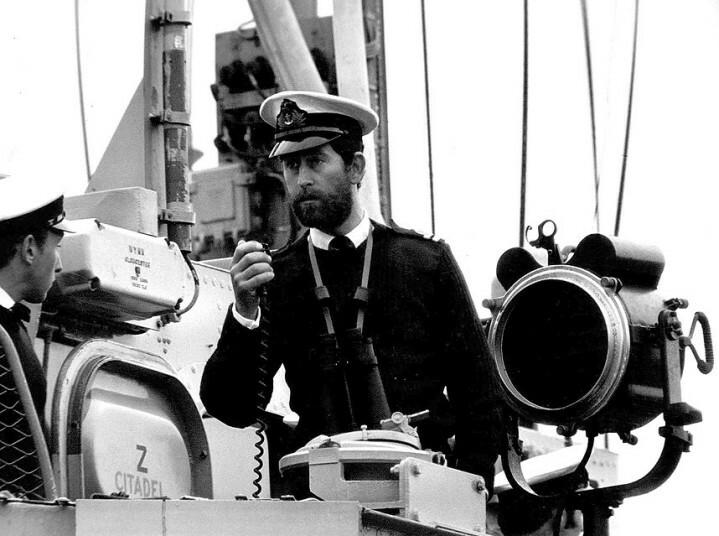 On 9 February 1976, HRH Lt the Prince of Wales took command for ten months, leaving the ship on 15 December 1976. On 14 November that year, during a visit to the Pool of London, HMS BRONINGTON was visited by the Queen, the Queen Mother, HRH Prince Philip and eight other members of the royal family. 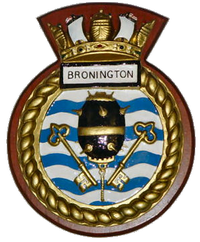 In the 1980s, in her final active years, HMS BRONINGTON was deployed to the Mediterranean as part of the 2nd Mine Counter Measures Squadron, and spending the last five months of 1983 detached in the NATO Standing Naval Force Channel, and was employed for a time as a member of the Fishery Protection Squadron. She entered Portsmouth to pay off on 23 June 1988. 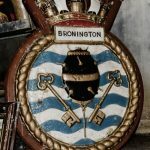 In January 1989, Parliament was informed that HMS BRONINGTON had been purchased by The Bronington Trust, a charity dedicated to her preservation and display to the public and on 24 January, she left Portsmouth for Manchester. She was opened to the public at Salford Quays on 28 October 1992. 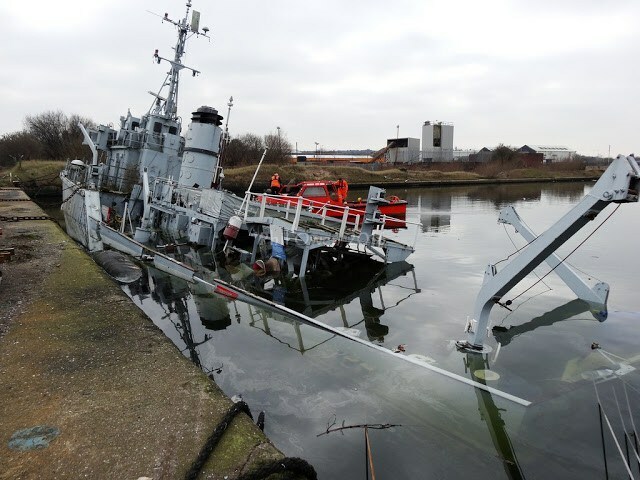 HMS BRONINGTON became part of the Warship Preservation Trust collection in 2002 and was moved to Vittoria Dock, Birkenhead, alongside HMS PLYMOUTH (Cert No 620) and LANDFALL (LCT-7074 Cert No 713). She was open to the public until the Trust closed in 2006, when she became the property of Mersey Docks and Harbour Company, following which she was laid up and deteriorated rapidly, particularly her wooden deck. On March 18th 2016 she was found to have sunk at her moorings.